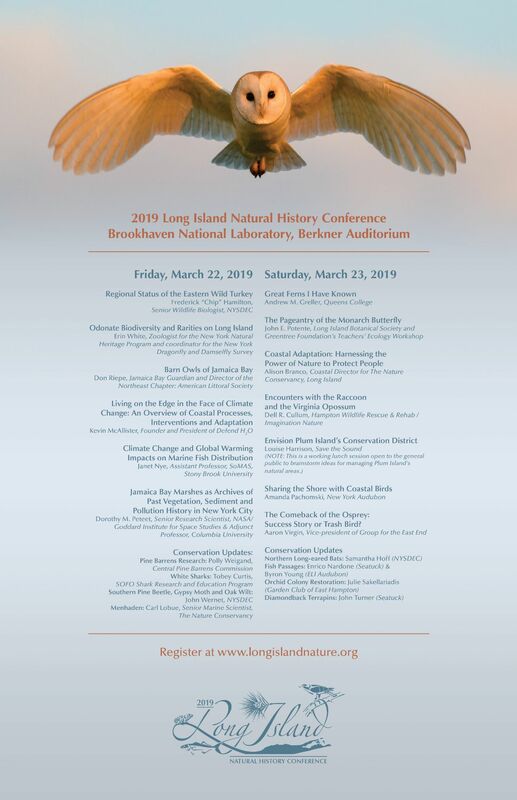 The seventh annual Long Island Natural History Conference will take place Friday, March 22 and Saturday, March 23, 2019 in Berkner auditorium at the U.S. Department of Energy’s Brookhaven National Laboratory in Upton, NY. It will comprise 20 presentations by leading Long Island wildlife biologists, marine scientists and naturalists on a variety of topics including orchid restoration, bats, diamondback terrapins, white sharks, menhaden, osprey, barn owls, wild turkeys, dragonflies, ferns, Monarch butterflies, global warming and sea level rise impacts on coastal habitats and marine fisheries, and new research initiatives in L.I.’s pine barrens. This year will also feature a working lunch charrette hosted by Save the Sound and The Nature Conservancy to solicit ideas for a Plum Island conservation plan. The conference is open to the general public and promises to be the largest regional forum for researchers, natural resource managers, students, and naturalists to present and exchange current information on the varied aspects of applied field biology (freshwater, marine, and terrestrial) and natural history of Long Island. It will serve as a premier venue to identify research and management needs, foster friendships and collegial relationships, and encourage a greater region-wide interest in Long Island’s natural history by bringing together people with diverse backgrounds. General admission (one or both days): $45; students: $25.